These DTCs relate to the throttle position sensor. The throttle position sensor is mounted on the throttle body, and detects the opening angle of the throttle valve. This sensor is a non-contact type sensor. It uses hall-effect elements in order to yield accurate signals even in extreme driving conditions, such as at high speeds as well as very low speeds. The throttle position sensor has 2 sensor circuits, each of which transmits a signal, VTA1 and VTA2. VTA1 is used to detect the throttle valve angle and VTA2 is used to detect malfunctions in VTA1. 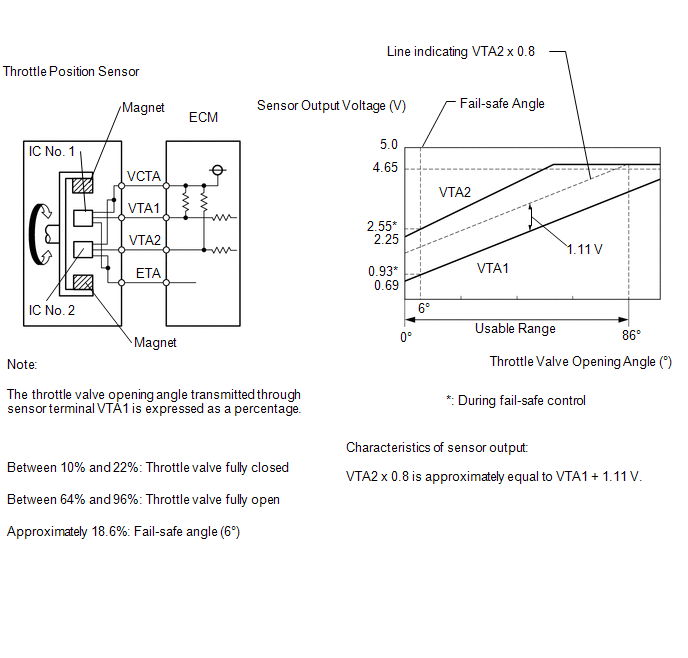 The sensor signal voltages vary between 0 V and 5 V in proportion to the throttle valve opening angle, and are transmitted to the VTA1 and VTA2 terminals of the ECM. As the valve closes, the sensor output voltage decreases and as the valve opens, the sensor output voltage increases. The ECM calculates the throttle valve opening angle according to these signals and controls the throttle actuator in response to driver inputs. These signals are also used in calculations such as air fuel ratio correction, power increase correction and fuel-cut control. When any of these DTCs are output, check the throttle valve opening angle using the Techstream. Enter the following menus: Powertrain / Engine / Data List / ETCS / Throttle Position No. 1 and Throttle Position No. 2. Throttle Position No. 1 is the VTA1 signal, and Throttle Position No. 2 is the VTA2 signal. The ECM uses the throttle position sensor to monitor the throttle valve opening angle. There are several checks that the ECM performs to confirm the proper operation of the throttle position sensor. A specific voltage difference is expected between the sensor terminals, VTA1 and VTA2, for each throttle valve opening angle. If the difference between VTA1 and VTA2 is incorrect, the ECM interprets this as a malfunction in the sensor circuit, and stores a DTC. VTA1 and VTA2 each have a specific voltage range. If VTA1 or VTA2 is outside the normal operating range, the ECM interprets this as a malfunction in the sensor circuit, and stores a DTC. VTA1 and VTA2 should never be close to the same voltage level. 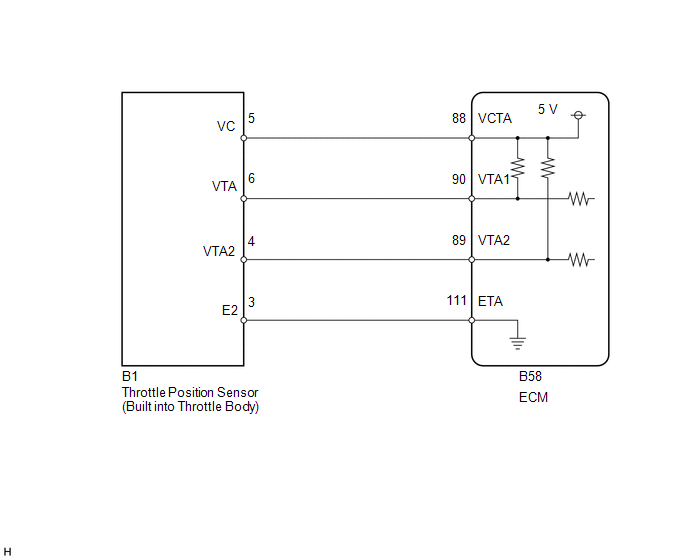 If VTA1 is within 0.02 V of VTA2, the ECM determines that there is a short circuit in the sensor circuit, and stores a DTC. This sensor transmits two signals: VTA1 and VTA2. VTA1 is used to detect the throttle opening angle and VTA2 is used to detect malfunctions in VTA1. The ECM performs several checks to confirm the proper operation of the throttle position sensor and VTA1. For each throttle opening angle, a specific voltage difference is expected between the outputs of VTA1 and VTA2. If the output voltage difference between the two signals deviates from the normal operating range, the ECM interprets this as a malfunction in the throttle position sensor. The ECM illuminates the MIL and stores the DTC. With the vehicle stationary, fully depress and release the accelerator pedal [B]. Idle the engine for 2 seconds or more [C]. Input the DTC: P0120, P0121, P0122, P0123, P0220, P0222, P0223 or P2135. If the judgment result shows INCOMPLETE or N/A, perform steps [B] and [D] again. When any of these DTCs, as well as other DTCs relating to electronic throttle control system malfunctions are stored, the ECM enters fail-safe mode. 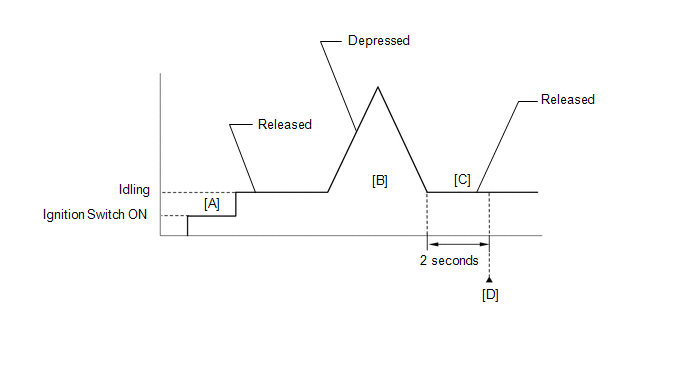 During fail-safe mode, the ECM cuts the current to the throttle actuator, and the throttle valve is returned to a 6° throttle angle by the return spring. The ECM then adjusts the engine output by controlling the fuel injection (intermittent fuel-cut) and ignition timing, in accordance with the accelerator pedal opening angle, to allow the vehicle to continue at a minimal speed. If the accelerator pedal is depressed firmly and gently, the vehicle can be driven slowly. (d) Enter the following menus: Powertrain / Engine / Data List / Throttle Position No. 1 and Throttle Position No. 2. DTC P0121 is stored when the voltages output from VTA1 and VTA2 are not consistent with the characteristics of the sensors. Therefore, check the Freeze Frame Data when this DTC is output. Use the following formula to confirm relative fluctuations in voltage. 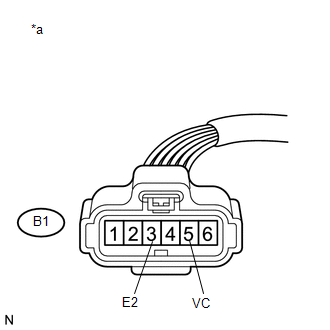 If DTC P0121 is output, proceed to the "CHECK HARNESS AND CONNECTOR (THROTTLE POSITION SENSOR - ECM)". (a) Replace the throttle body (See page ).